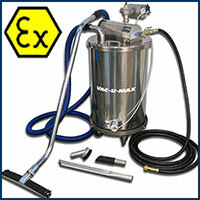 VAC-U-MAX compressed-air powered vacs are ATEX certified and ideal for Class II, Division 2 environments. Systems meet NFPA 77 requirements for grounding and bonding. Each “Intrinsically-Safe System” includes vacuum cover, drum, dolly, vacuum hose, cleaning tools, compressed air hose with quick-disconnect fittings and polybag drum liners.